The United States has started the process of reconciliation with Cuba in an atmosphere of vast goodwill and a huge dosage of optimism. Surprisingly, very little opposition has been encountered. Eventually American retirees and travelers will be seeking inexpensive living, untouched beaches, and a welcoming populace on a Caribbean island that can be found only 90 miles away from U.S. shores in Cuba. Nicaragua has begun the planning of its own canal connecting the Caribbean with the Pacific that is likely to dwarf the modernizing of the Panama Canal Project that lays mired in scandal. Meanwhile, much of the Venezuelan sources that helped prop up the regime of President Ricardo Martinelli is being lowered with the ever-decreasing price of oil. Panama’s social security network, its incomplete metro, and other major infrastructure have been ransacked by corruption and lay in tatters while several social institutions are nearing bankruptcy. Crime has gone rampant with the U.S. Embassy having recently issued warnings to American citizens to proceed with care in Panama and avoid several areas of the country. All of these concerns stem from instances of corruption and embezzlement. However, there is some hope as Panamanians are now crying for justice. Prosecutors have arrested and later indicted former Chief Justice of Panama’s Supreme Court, Alejandro Moncada Luna, and seized millions of dollars in his accounts. The former head of the Panama National Assistance Program and the former Secretary General of the CD party started and controlled by ex-president Martinelli are under house arrest. An investigation of the former Minister of Social Development has begun and large-scale nationwide marches of concerned citizens against “Corruption with Impunity” have taken place. There is still hope for Panama in part due to the demands of the population calling for an end to the corruption that is ruining their lives. The hope for such a positive outcome lies with Panama’s new President Juan Carlos Varela. In less than a year, he has replaced key Panamanian officials in critical government positions, seemingly in effort to clean up the mess. However, the Panama Supreme Court may have dashed the burgeoning hopes of many Panamanians with their latest appointment of a former questionable Supreme Court Justice, who was one of the three Justices named in the Lucom case. This Justice was not named to the Supreme Court again. However, he was appointed to another important position in the Panamanian judicial system. This new hope may have come too late for thousands of poor and malnourished Panamanian children who have been denied a huge legacy of more than one hundred million dollars. The money was left to them by an American expatriate Wilson Lucom who willed his entire fortune to the “poor children of Panama” to feed them, only to have three Justices of the Panama Supreme Court who have transferred the fortune to Lucom’s 88 year old widow, who unbeknownst to the courts in Panama and Florida, transferred her inheritance to an anonymous and secret Panamanian corporation years before the corrupt ruling. Hilda died shortly after the corrupt court ruling. According to a recently filed lawsuit in Florida, the information came out too late to prevent bribed illegal Panamanian court instructions from being introduced into the Florida Court system that misled the Florida courts. Will President Varela and this brave new group of reformers be able to continue to expand the cry for justice from Panama’s people? The question is still whether the most powerful oligarchs will remain untouched by the investigations. This revolution for justice has been building since 2010 with the infamous court case dealing with the will of Wilson Lucom. The Council of Hemispheric Affairs last reported on Panama’s infamous court case dealing with the poor children of Panama and Wilson Lucom’s will in 2011. The report was issued as an update to an earlier analysis in 2010. Since that time, recent dramatic developments have led to a new round of litigation. The Lucom case is extraordinarily complex. However, it is important to at least consider some of the simple facts. Wilson Charles Lucom, a multimillionaire United States citizen who expatriated himself to Panama, left a will bequeathing the bulk of his vast estate to a trust established for the purpose of feeding the poor children of Panama. Within five years of his death, Lucom’s widow and third wife, Hilda Arias, obtained legal opinions in the Panamanian Supreme Court that placed her in sole control of the estate and use it as she saw fit. Needless to say, Hilda’s vision for the estate did not include the impoverished children of Panama. To this day, not one penny of the Lucom estate has gone to feeding a single hungry child. The World Bank reports that 37 percent of the Panamanian population lives below the poverty line; 19 percent of which lives in extreme poverty. In addition, 50 percent of Panamanian children are considered poor. During his lifetime, Wilson Charles Lucom did not have noticeable interest in statistics such as these. Media accounts of Lucom typically characterize him as gruff and curmudgeonly. Those in close familiarity to Lucom agree that he was not someone with an overriding sense of philanthropic responsibility. However, this fact does not negate the fact that he was not a man who would enjoy defying the expectations of Hilda’s children, the product of her first marriage to an upper class Panamanian. Lucom had no children of his own. Make no mistake, Lucom’s bequests to his wife and stepchildren left them very well off, but perhaps not as fabulously wealthy as they had calculated they would be after his untimely demise. Does it matter in the eyes of the law why Lucom decided to give his entire estate to benefit the poor children of Panama? No, of course it does not. Does it raise questions regarding the will’s validity if it is not consistent with expectations? It shouldn’t. Moreover, Richard Lehman, a highly regarded Florida lawyer and longtime friend and attorney of Lucom’s, sees the will as perfectly consistent with Lucom’s intelligence and wit, which he carried while alive. No one, least of all Lucom, predicted that a corrupt Supreme Court of a country would allow Hilda’s family to gain complete control of his estate, contrary to the plain language of his last will and testament. Lucom named Lehman as an executor in his will; yet by 2010, in a series of quick moving steps, Lehman had been removed as executor of the estate by Panamanian courts and his reputation was being called in question. Based upon a series of Panama Court rulings, press accounts for the period of 2010-2011 had suggested unethical actions by Lehman in seeking to uphold his friend’s wish to leave his fortune to a foundation created expressly for the purpose of feeding hungry children. It would be understandable if at this point Lehman had admitted defeat, especially given the incessant press reports that began appearing in U.S. media. However, giving up is not part of Lehman’s legal repertoire, especially given the egregiously corrupt treatment of the Lucom Estate. In recent months, new previously undisclosed information became available to Lehman and his associates who include lawyers he had retained in both the United States, as well as Panama. This is information that provided indisputable evidence that the administration of the Lucom estate was fraudulent and that agents of Lucom’s widow, Hilda, acted with specific intent to besmirch Lehman’s reputation and hide assets from taxing authorities. A separate proceeding in Panama is currently uncovering the deep-seated corruption of the Panama Judiciary. Finally, at the time of COHA’s last report (2011), attacks against Lehman in the press were beginning to surface, but had not yet risen to their crescendo. By 2011 adverse judicial decisions and negative press permeated the case, seemingly bringing to an end any chance of the Lucom Foundation operating as Lucom intended. Lehman’s quest became less quixotic as unrelated investigations exposed corruption in Panama’s judicial system. Interestingly, most of the revelations about the corrupt Panama rulings, came from a Panamanian lawyer previously associated with the law firm representing Hilda Lucom. The lawyer came forward with key eyewitness reports of fraud leveled by her and her former law associates and putative claimants to Lucom’s estate. Her statements reveal a deliberate effort to defraud both the United States and Panama and a craven plan to gain control of Hacienda Santa Monica, the 7,000-acre ranch on the Pacific Ocean, which was the primary asset of the Lucom estate. Now armed with these previously hidden facts about illegal Panama rulings, the truth may soon prevail. The Panamanian lawyer disclosed Court documents that had been hidden from the US and Panamanian courts since 2007. These hidden documents, together with other disclosures showed that Hilda Lucom had transferred all of the rights to her inheritance as early as the year 2007 to an anonymous Panamanian corporation controlled by her Panama lawyers. Thus, at the time the Panama Supreme Court awarded Lucom’s Estate to Hilda, she no longer had any rights to it; fooling even the Panama Supreme Court. Furthermore, the Panamanian lawyer disclosed the names of the parties and the modis operandi of those responsible for corrupting various members of Panama’s judiciary to issue the orders that ultimately were introduced into, and fooled both the Panama Courts and the Florida courts. The contours and outcomes of the case from its inception in 2006 to the present day were often byzantine, bringing to mind Charles Dickens’ indictment of the English judicial system in Bleak House. The Lucom case has spawned a dizzying array of claimants to the will, with the original intended beneficiaries – the poor children of Panama – turned into the perpetual losers with every new benchmark of the case. There is good reason to believe that justice may finally prevail, now that concrete evidence is available concerning the fraudulent actions of claimants to the will and the corrupt cooperation of the Panamanian courts in recognizing Hilda Lucom as “universal heir” to Lucom’s fortune. However, nothing is so simple or as straightforward in this case or in such a tainted society as Panama. The largest part of Lucom’s gift to the poor children of Panama has been valued at One Hundred and Fifty Million Dollars USD ($150,000,000), enough to feed Panama’s poor children and allow for their independence for decades. In this sense, the damage extends beyond the children of Panama as a whole. Lucom’s hopes for this vast piece of property were the Grand Panama Project. The project envisioned by a group of Saudi and American investors who had two signed contracts to purchase the land from Lucom; but who never were ever permitted to claim their rights in the Panama Courts. Grand Panama was to be a $3 billion USD branded city filled with hotels, casinos, golf courses, a marina, the potential of over 9,000 residences, and much more. This kind of development would have been invaluable to Panama and its people. Thousands of jobs would have been created during construction of the city and even more permanent jobs when it was completed, not to mention the possibilities for a boost in infrastructure. So where is this big beautiful city? The plans have been halted. Interestingly enough, the Panamanian government made no effort to continue the assembly of the city that could have been a significant boost for Panama. Some may say this is because government representatives have no real interest in the improvement or development of Panama, but only an interest in themselves. Finally, for the first time since the initial reading of Lucom’s will, prospects are looking up for the children of Panama. But make no mistake, this matter is far from over. Facts favorable to the original intent of Wilson Lucom’s will are just now coming to the forefront. This is as a result of new complaints being filed in the U.S. and Panama. 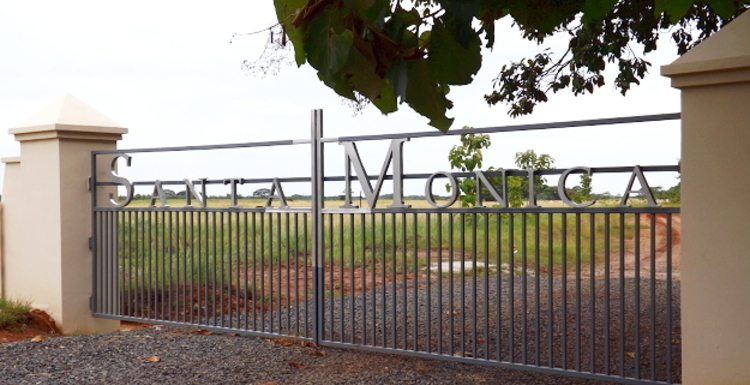 While the matter is in litigation, steps are being taken to ensure the primary asset of the Lucom estate, Hacienda Santa Monica, is preserved or that ultimately its proceeds are reinvested to fund the Foundation for the Children of Panama. The plight of the hungry children of Panama is a fact virtually obscured in the unfortunate tangling of a web of deceit and fraud that has characterized the probate of Lucom’s estate. It is true that 2015 marks another yearly notch in this ongoing corruption scandal. It is also true that with the help of brave prosecutors and reformers who are willing to stand up to the power elite and help Panama live up to its potential as a land of decency and justice, with this New Year there is a good chance that Lucom’s vision for uplifting the poor children of Panama will be finally realized. Picture by Eric Jackson “Hacienda Santa Monica”.